I love every little hair on this dog. That’s a good thing, since her hair is everywhere in my home, my car, and on my clothing. We recently replaced all of the broken blinds on the ten floor-to-ceiling windows on the south side of the house with curtain panels that can be drawn all the way to the side to reveal our back yard. The animals adore it even more than I do, I think. Zoe loves gazing out the back window to make sure no neighbors come within sight of our domain. American Eskimo Dogs are like that. 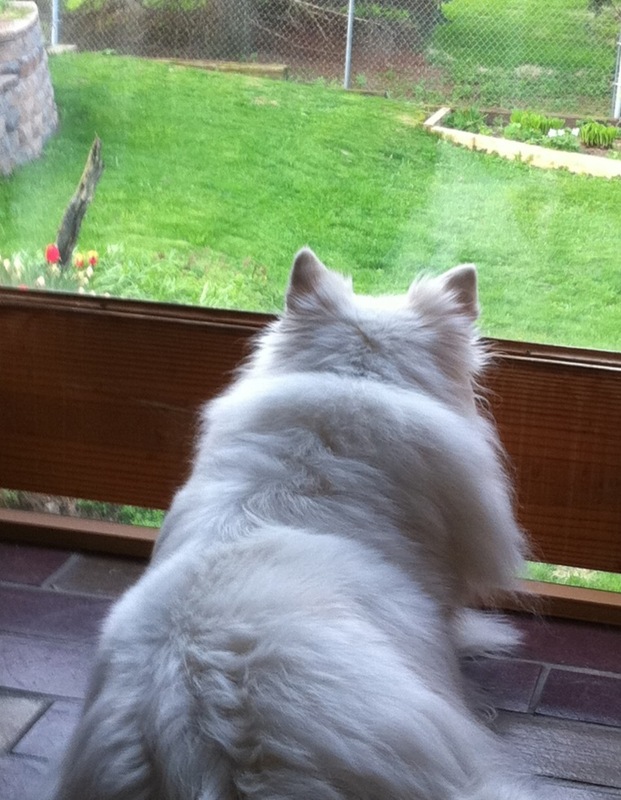 This entry was posted in Animals, photography and tagged american eskimo dog, dog, photography, postaday2011, Window Coverings. Bookmark the permalink. She is surveying for polar bear threats. Or squirrels. Or bunnies. But especially neighbors.